A new year. New resolutions. New hopes and wishes for the future. At this time of year, many Americans are readying their pots for Hoppin’ John or black-eyed peas and greens, but did you know there are dozens of other foods that are said to bring good luck in the new year? Stack the odds in your favor with this menu of traditional good-luck foods from around the world. Begin your gathering with a simple plate of grapes and cheese to get the good luck going. “The 12 Grapes of Luck” is a Spanish tradition that has migrated to Latin American countries and the Philippines. At the stroke of midnight, the tradition calls for celebrants to eat a grape at each stroke of the church bell, one for each month of the past year. In North and South America, Europe and Asia, lentils and other beans are thought to bring prosperity because they resemble coins, and they swell when cooked. This Lentil Salad with sweet berries will get the year off to a sweet start. Fish has been a feast food since the Middle Ages because it’s easy to preserve by salting and drying. And fish are considered lucky in Asia because they’re always moving forward. So it’s a natural choice for a New Year’s feast. This Simple Herbed Salmon is easy as well as lucky—it uses just a few ingredients and bakes in less than 15 minutes. Pork, because of its high proportion of fat, is considered lucky in many countries, such as China and Italy. Our Tomato-Glazed Stuffed Pork Loin provides lots of immunity-building nutrients—vitamin B6, vitamin C, zinc, selenium and antioxidants—to keep you healthy and lucky throughout the new year. Greens were once considered a symbol of paper money, leading people around the world to feast on New Year’s greens, from spinach to cabbage to our American mustard greens. Additionally, lasagna is traditionally eaten for good luck at Italian New Year’s celebrations. So bring our Broccoli-Spinach Lasagna to the table and raise a glass to a cash-filled year. 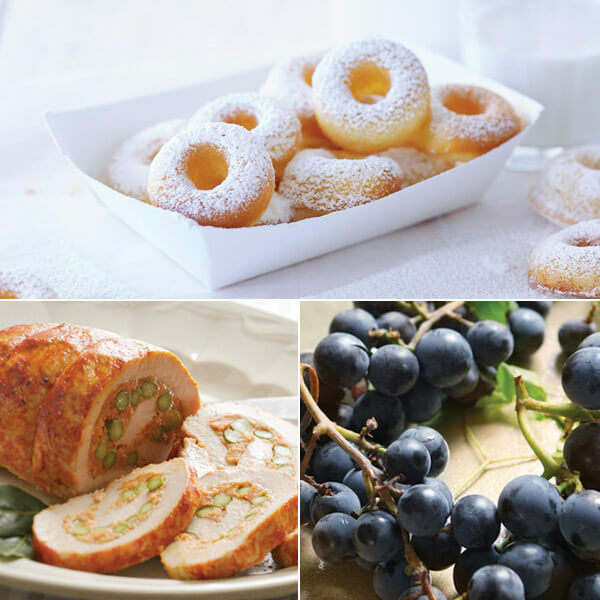 Ring-shaped desserts have a special place at New Year’s celebrations. They symbolize wealth and prosperity. The Dutch believe that circles are a symbol of success and have a tradition of making and eating donuts each year. And in Greece, cakes are baked each year with a coin hidden inside. The finder of the coin is blessed with luck throughout the coming year. Try these donut and mini Bundt cake recipes to add more circles (and more luck) to your table.